Navassa Island (French: La Navasse, Haitian Kreyòl: Lanavaz or Lavash) is a smaa, uninhabitit island in the Caribbean Sea, claimed as an unorganized unincorporatit territory o the Unitit States, which admeenisters it through the U.S. Fish an Wildlife Service. 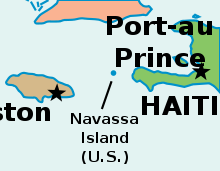 Haiti, which haes claimed sovereignty ower Navassa syne 1801, an aa claims the island in its constitution. Navassa Island is aboot 2 square miles (5.2 km2) in aurie. It is locatit 90 nautical miles (100 mi; 170 km) sooth o the U.S. naval base at Guantanamo Bay, Cuba, 40 nautical miles (46 mi; 74 km) wast o Jérémie on the sooth wast peninsula o Haiti, an aboot ane-quarter o the wye frae Haiti tae Jamaica in the Jamaica Channel. It reaches an elevation o 250 feet (76 m) at Dunning Hill 110 yards (100 m) sooth o the lichthoose, Navassa Island Licht. This location is 440 yards (400 m) frae the soothwastren coast or 655 yards (600 m) east o Lulu Bay. The island's latitude an longitude are 18°24′10″N 75°0′45″W﻿ / ﻿18.40278°N 75.01250°W﻿ / 18.40278; -75.01250. The terrain o Navassa Island consists maistly o exposed coral an limestone, the island bein ringed bi vertical white cliffs 30 tae 50 feet (9.1 tae 15.2 m) heich, but wi enough grassland tae support goat herds. The island is covered in a forest o just fower tree species: short-leaf fig (Ficus populnea var. brevifolia), pigeon plum (Coccoloba diversifolia), mastic (Sideroxylon foetidissimum), an poisonwood (Metopium brownei). Its topography an ecology are similar tae that o Mona Island, a smaa limestone island locatit in the Mona Passage, atween Puerto Rico an the Dominican Republic. It shares historical similarities wi Mona Island syne baith are U.S. territories, wur once centers o guanae minin, an presently are naitur reserves. Transient Haitian fishermen an ithers camp on the island but the island is itherwise uninhabitit. It haes na ports or harbors, anly affshore anchorages, an its anly naitural resoorce is guanae; economic activity consists o subsistence fishin an commercial trawlin activities. Thare wur aicht species o native reptiles, aw o which are believed tae be, or tae hae been, endemic tae Navassa Island: Celestus badius (an anguid lizard), Aristelliger cochranae (a gecko), Sphaerodactylus becki (a gecko), Anolis longiceps (an anole), Cyclura (cornuta) onchiopsis (a rock iguana), Leiocephalus eremitus (a curly-tailed lizard), Tropidophis bucculentus (a dwarf boa), an Typhlops sulcatus (a tiny snake). O these, the first fower remain common, but the last fower are likely extinct. ↑ Rohter, Larry (October 19, 1998). "Whose Rock Is It? Yes, the Haitians Care". Port-au-Prince Journal. The New York Times. Retrieved January 28, 2012. ↑ 8.0 8.1 Powell, Robert (2003). Reptiles of Navassa Island. Avila University. This page wis last eeditit on 3 Mairch 2018, at 23:33.